Take the exceptional 1/32 scale Zoukei-Mura F-4J Phantom II Plastic Model Kit (#87620, available separately) to the stratosphere of model building excellence with custom-designed accessories! Painstakingly crafted and carefully selected, these optional components, paints and more further enhance various aspects of the model and allow the builder to capture an unmatched level of realism. Acrylicos Vallejo Paint Set for the Zoukei-Mura F-4J Phantom II Plastic Model Kit has been carefully selected for the most accurate match to the prototype possible. 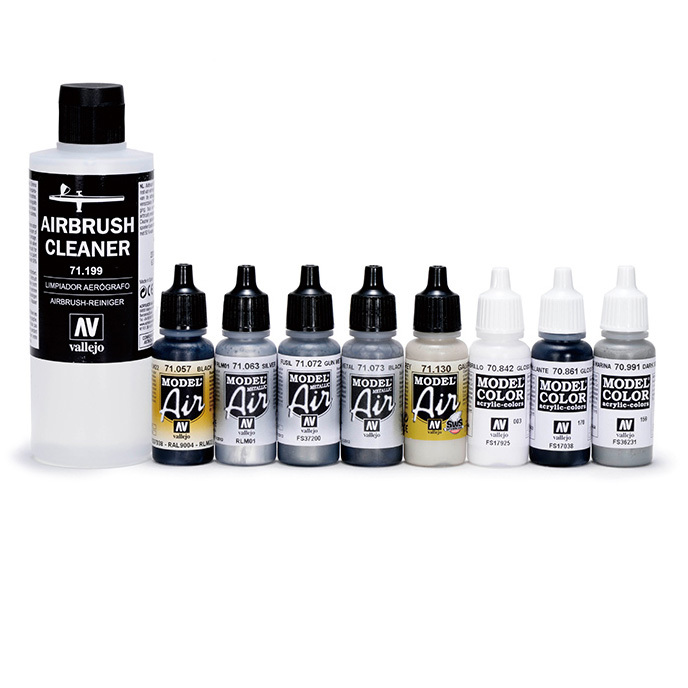 Water-based AV Model Air paint is formulated especially for airbrushing straight from the bottle . . . no thinning or special mixing is required. Made with finely-ground pigments and airbrush-perfect viscosity, Model Air goes on smoothly and covers well, even with just a thin coat. Tiny surface details won't be obliterated, and the resulting matte finish is durable and waterproof. Model Air acrylic paints are non-toxic and odor-free, and clean-up easily. Set includes 8 colors: Gull Gray, Gloss White, Black, Gloss Black, Black (Metallic), GunMetal (Metallic), Silver (Metallic), Dark Sea Grey, plus a specially formulated Airbrush Cleaner.